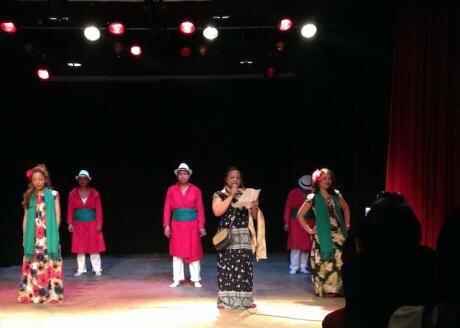 Performances by migrant domestic workers during a celebration of women's day in Beirut. Picture by authors. Used with permission. As one dance ended and the audience burst into applause, loud Ivorian beats began to blare from the speaker in preparation for the next performance. The room, full of beautifully dressed women in saris, pagnes, jeans and shiny sequinnedtops, jostled for space in the packed theatre. It might not seem a lot to ask for, but in Lebanon where these women work, their most basic human rights are systematically violated. Just two years ago, domestic workers would face detention and deportation if they were found to have a relationship. “They even want to control who we love and when we love”, Rose told us. There are an estimated 250,000 migrant domestic workers in Lebanon, making up nearly 10% of the country’s female population. Excluded from the national labour law, migrant domestic workers are forced to work under the infamous Kafala system, a system of sponsorship that binds an employee to their employer in a slave-like relationship. Under Kafala, the right of an employee to enter, work and reside in Lebanon is utterly dependent on their employer. A complex recruitment process has played a major role in institutionalising abuse over migrant workers. Agencies in Lebanon work with partners and middle-men in emigration countries, often sponsoring human trafficking where countries have banned legal emigration to Lebanon. Over 65% of migrant domestic workers feel that they had been lied to about the nature of the work and tricked into conditions that human rights groups define as servitude or slavery. Systematic abuse of domestic migrant workers is endemic. An estimated 50% of employees work over 85 hours a week. Reports account that 20% of domestic workers are locked in their employees’ house, while 40% have their wages withheld despite this being against Lebanese law. As institutionalised racism in Lebanon continues largely unchecked, detention, deportation and death are often the only options of escape from abusive employers. The death toll in Lebanon is estimated at two migrant workers per week as a result of suicide, murder and botched escape attempts. And it is not unusual to hear of employers avoiding justice as cases get dismissed for insufficient evidence. Nonetheless, harrowing reports of suffering are widely documented,on websites like “Ethiopian Suicides” which was monitoring deaths until 2015. The women who make up this group are formidable. Some of them having been activists for over 20 years in the hardest conditions as Lebanese authorities do not recognise the right of migrant workers to unionise. Their strength is not only evident through their activism, but also in their ability to create a safe space for domestic migrants workers to come together and share their experiences. The Alliance meets on Sundays, with members using their only day off to support others. “But we have each other”, Rose added, gesturing proudly at the other members of the Alliance. Focusing on grassroots community outreach activities, the Alliance builds trust and solidarity amongst domestic migrant workers throughout Lebanon. Withholding salary seems to be an ordinary practice amongst employers, a practice also recommended by recruitment agencies when advising employers on how to treat their workers. In the many conversations we held with domestic workers, it appeared that a ‘good employer’ is someone who does not physically or sexually abuse their maid. Niaman, who has worked for 4 years with the same family in Tripoli, repeated how lucky she was to be working for a ‘good employer’ who after two years had trusted her enough to allow her to buy a phone and have three hours off work every other week. She was also allowed to grow her hair a little longer, after being forced to cut it when she first arrived because it would use too much water to wash it. During an undercover interview at a recruitment agency in Tripoli, we enquired about the process to hire a maid. When we asked whether she was entitled to any holidays we were met with laughter: “No, no day off. And if she is sick then you can send her back here and we will get you another one.” We were also told not to give her a telephone “it will just distract her” and to lock her in the house until we trusted her. When asked about steps made by countries producing foreign domestic workers to support their citizens working in Lebanon, the members of the Alliance sighed. “When they ban travel, it means that people just come illegally and then it is even more dangerous for the domestic worker because no one knows where she is and she has no papers”, said Lilly, a worker from the Philippines; a country which has one of the most organised support systems for foreign domestic workers in Lebanon. Dolores, who has worked in Lebanon for 25 years and has two small children in Lebanon agreed. “The recruiters usually target the most uneducated girls from villages who believe whatever they are told. One girl who came with no papers from Nepal tried to escape by jumping out the window because she thought the mountains of Lebanon were the mountains of her village in Nepal”. Where it is currently too dangerous for domestic migrant workers to speak out, the international community must intervene, pushing Lebanon to ratify ILO’s Convention No. 189 on Decent Work for Domestic Workers. But aware of the timings and illusions of politics, the women of the Alliance are wasting no time, keen to take the struggle in their own hands. Before leaving the theatre, Serena, a dancer in the performance spoke to us: “the realization that support is available through shared experience can be so much more powerful and long lasting than any sit-in or demonstration. This is no simple political game. Our lives are on the frontline”.